Second update: February 28, 4:01 p.m.
Unopposed and independent candidates bagged council positions in the UP School of Statistics Student Council (UPSSSC) in Thursday’s polls. Incumbent UPSSSC Sports, Arts and Culture Councilor James Warlie Frias garnered 298 votes, clinching the post of Chairperson, while incumbent Finance Councilor Faith Marcelino secured the position of Vice Chairperson with 316 votes. UP ALYANSA’s Cris Ian Mendoza, incumbent Third Year Representative, will be representing the college to the University Student Council after earning 200 votes. All candidates ran unopposed, and are all independent except for Mendoza, who is aligned with ALYANSA. 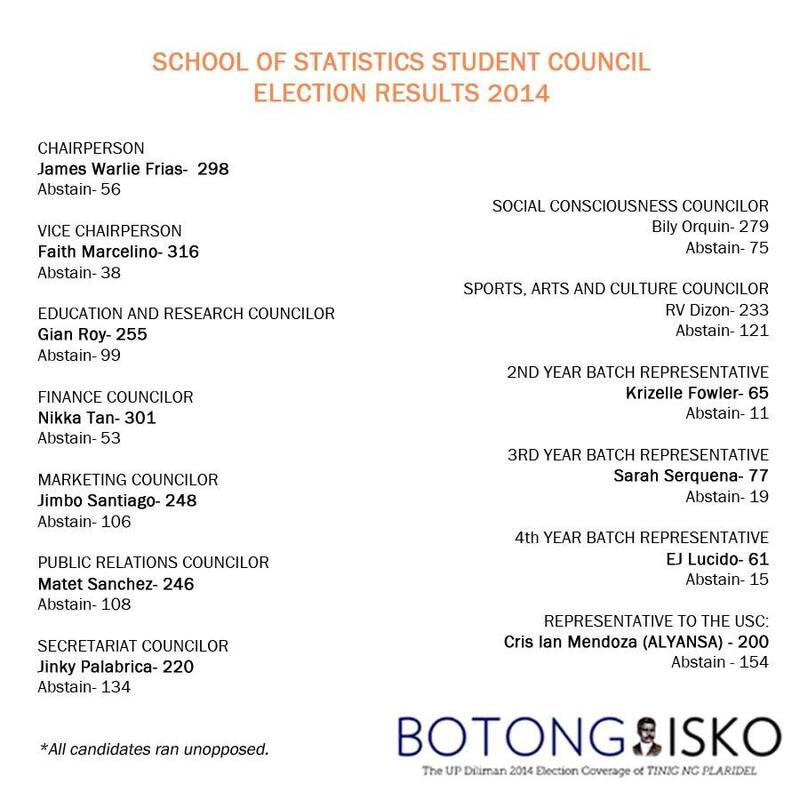 Stat posted a 64.8% voter turnout with 354 out of 546 students. Polling lasted from 8:30 am to 7:00 pm and encountered no technical problems, according to College Student Electoral Board members.